The last eighteen months of elections in Western democracies have had one constant: volatility. Britain voting to leave the EU in June 2016 was the first in a series of surprising outcomes across democracies as diverse as France, the USA, New Zealand and Germany. 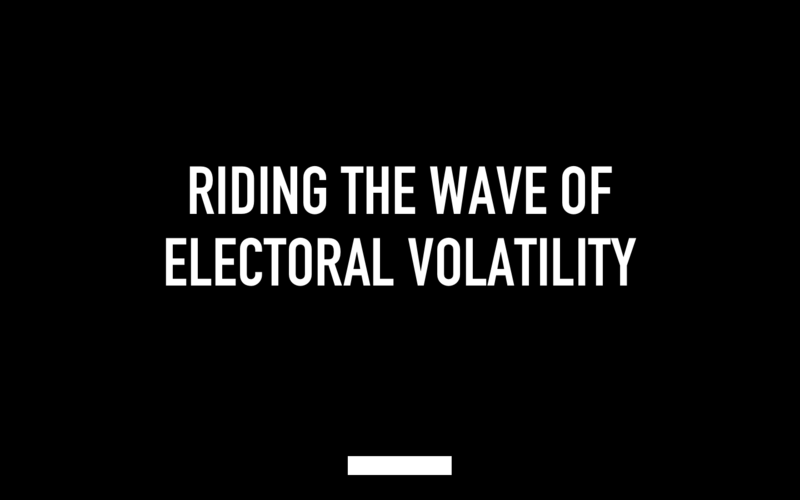 As the people casting ballots are the same as those standing at the checkouts, business leaders can benefit from understanding the drivers of electoral volatility and learning lessons from the parties and groups that have successfully motivated the public in a time of relative instability. On the eve of the Brexit referendum poll renowned political scientist Professor John Curtice predicted a Remain win, but warned that confidence in any projection was misguided as there was “a cloud of uncertainty” surrounding voters’ preferences. A year and a half on, that cloud of uncertainty has not lifted; unexpected and unprecedented results have become the norm. In France, a party founded just 12 months prior to election day won both the Presidency and a parliamentary majority. In the UK a far-left Labour Party chased down a 24-point Conservative lead in the polls. In New Zealand, a centre-right government led by a popular Prime Minister who could boast of a growing economy was turfed out by an opponent who’d only been in the job 6 weeks. Germany, a symbol of political stability during the last decade, is in turmoil as Angela Merkel finds herself unable to form a government 3 months after polls closed. Electoral volatility was a surprise to most analysts and commentators, but as early as 2010 political scientist Peter Mair warned of a ‘hollowing out of western democracy’ and predicted that elections would become more erratic. His predictions came to glaring fruition. The fact that people are straying from historical allegiances in the UK is clearest to see in the North of England and Scotland where large numbers of people have switched to voting Conservative. Further evidence can be found in the fact that the last two UK general elections – 2015 and 2017 – saw the largest movement of votes between the parties since 1931. An example of a short-term factor having a disproportionate impact on voting intention can be found in the fact that FBI Director James Comey’s infamous letter to Congress regarding Clinton’s email saga led to Trump halving her lead in polls. Whilst the headlines following the French elections earlier this year were about Macron’s success, another surprising subplot was the incredibly low turnout at their parliamentary elections: the lowest ever at 48.7%. And one is spoilt for choice when looking for examples of new parties emerging and gaining sudden popularity; the two most notable are arguably En Marche (founded in 2016) winning a parliamentary majority in France and the far-right German AfD (launched in 2013) gaining 13% of seats in the German parliament. The symptoms of volatility are showing in a myriad of ways, but what is causing it? There are three leading hypotheses. The first hypothesis for why people are fickler is that the things that bind people together and make them likely to vote in a certain way are changing. In the past, if you knew where someone lived, knew what they did for work and knew how much they earned, you could be fairly confident about which way they would vote. The graph on the left shows the proportion of people voting Labour and Conservative in 2017 was roughly equal across all socio-economic grades. Whilst the graph on the right shows that if you’re under 50 you’re more likely to vote Labour than Conservative. It’s not just age. Education, national identity and ethnicity are better predictors of which way someone will vote than income or occupation. The old class cleavages are no longer so important. The second, related, hypothesis is that because the old cleavages have weakened, people feel less connected to the political parties who were founded to cater for those divisions in society. The graph on the left shows the number of people saying they are “independent” is on the rise in the US. The graph on the right shows an overall downward trend in the number of people being members of political parties in the UK. Voters are no longer blindly following a party allegiance based on their demography. People don’t believe politicians will be able to do what they say they will. Nor do they trust that politicians will do the ‘right thing’, as the above chart shows. Using the 2017 UK general election as a case study we have developed 5 observations on how to run a successful election campaign in an era of unpredictability. Then we have extrapolated from them tips for business leaders whose brands are campaigning daily for election by customers. We are at the beginning of an age of identity politics. People are increasingly voting in line with the social groups that they identify with, rather than on the basis of their socio-economic status. As a result of this, successful political parties don’t position themselves on a left-right axis. Instead they look for an idea about the world which is most appealing to the widest spectrum of social groups (or ‘tribes’ as Seth Godin termed them). The idea that has proved most successful in Western democracies thus far in the age of identity politics is ‘the donut’: the belief that there is a small establishment elite in the hole on the inside getting all the benefits from an unfair society, and a large group of ordinary people struggling on the outside ring. This single narrative unites political leaders as diverse as Donald Trump, Bernie Sanders, Marine Le Pen, Emmanuel Macron, Jeremy Corbyn, Beppe Grillo, Nigel Farage and Jacinda Ardern. Theresa May’s ‘donut’ campaign failed because she struggled to stick to her original narrative of “defying vested interests for those ‘just about managing’” and resorted to merely reminding people that she wasn’t Jeremy Corbyn. Corbyn stubbornly (and sucessfully) stuck with his message of being consistently on the side of the marginalised and, in doing, so connected with increasing numbers of social groups. Lesson #1: use ideas which resonate with the way in which people identify themselves – computer gamer, new mum, golfer, rebel – rather than ones which speak to a demography (time to delete that chart on millennials). Elections are living, breathing things. Thousands upon thousands of brains, eyes, thoughts and desires rapidly responding to events. To react appropriately and control the election narrative, quick decision making is paramount. The 2017 general election was Corbyn’s third national election campaign in three years, having competed in Labour leadership elections in both ’15 and ’16. That means it was the third time his team had campaigned together. It was their third time running a series of major rallies at locations across the country. And it was their third successful attempt at expanding the electorate to include new voters. Thanks to the persistent internal challenges of the Labour right, Team Corbyn had gelled and were able to make quick decisions and act nimbly in response to events. Their opponents operation was led by Nick Timothy and Fiona Hill, neither of whom had ever run a national campaign. Theresa May supplemented them with the experienced hands of Lynton Crosby and agency Edmonds Elder, but despite being the person to choose the date of the election, gave her team only gave them 7 weeks to figure out ways of working, roles, responsibilities and build good relationships. It’s not surprising that they struggled (as evidenced by the very public mud-slinging in the national media after the result). Lesson #2: Stability in your team can help deal with volatility effectively. A hastily assembled team, or one with high levels of churn, is unlikely to move as quickly as one that has had time to gel. And the leadership needs to be intimately involved. A lot has been written about how Labour ran a very positive campaign. And that is true, to an extent. Labour did paint an optimistic picture of the future. But they were able to do so as they had an army of supporters who did their dirty work for them. The image below shows a list of all groups registered with the Electoral Commission as ‘non party campaign groups’. These are groups who are able to raise and spend up to £400,000. 30 of 54 non-party campaigns were anti-Conservative. Only 1 was pro Conservative. Others were either non-party aligned, single-issue-focused or an individual. Groups like Unite the Union and Momentum did all Labour’s dirty work for them. This is very similar to what happens in the USA where outside groups run attacks so that candidates can remain untainted. As well as having a huge range of advocacy groups raining down attacks on the Tories, Labour used influencers well. The #grimeforcorbyn movement was a clever tactic for making Corbyn seem relevant to hipsters and young people (or ‘tastemakers’) and helped make Theresa May and the Conservatives seem even more unconnected culturally. Lesson #3: The internet is a big place with a long tail of ‘tribes’; to appeal to enough people, you need a wide range of influential people in your corner. Having a clear enemy helps to bond your advocates; something challenger brands are already successfully doing; your antagonist doesn’t need to be a competitor, it could be something like ‘bad customer service’ or ‘boring flavours’. At this election, we saw two distinct philosophies as to how best deliver a message to the electorate. The Conservatives had a single unifying idea – ‘strong and stable leadership provided by Theresa May’ – and executed it using a bank of centrally produced assets that were consistent and uniform. Labour’s campaign also had a single unifying idea – for the many, not for the few – but the executions were hugely varied and the most powerful ads were not by campaign HQ. The varied nature of the execution meant that it was more likely to appeal to the various different tribes that exist online. And it turns out that having an idea that the official campaign can execute effectively is no longer enough, it needs to be able to inspire other groups to take it and run with it. Lesson #4: ideas need to be springboards that a wide range of organisations can easily adopt. Media owners, influencers, regional markets, stakeholders and brand fans need to be able to take ideas and run with them. ‘Matching luggage’ also feels increasingly outdated; making your idea work as well as possible for a given segment and channel is more important than making it look like other executions in the same campaign. In 2015 the Conservative Party outspent Labour seven-fold on social media advertising and spent 50 times more than the Lib Dems. That wasn’t purely because of different campaign budgets, it was because of resource allocation decisions. In 2017, that discrepancy in digital media spend will likely prove to be much smaller. Micro targeting using Facebook media buys is now a hygiene factor in election campaigns. The main difference in media share was the quality and quantity of earned coverage generated by Corbyn’s team vs. that of May’s. On the campaign trail, was widely criticised for avoiding the public, a criticism many Prime Ministers before her have faced in general election campaigns. She spoke at carefully managed events with small invitation-only audiences; a tactic that frustrated the journalists that accompanied them. This fact, combined with lacklustre media performances and a refusal to debate Corbyn, meant that her earned media share was lower and more negative in tone than the Conservatives would have hoped for at the outset of a campaign, when her personal brand and media support was very high. By contrast, Corbyn made himself seem to be completely available to the public. He spoke at large rallies. He gave journalists things to write about by taking daring decisions, such as turning up at the TV debates unexpectedly. This produced better pictures and more engaging stories for the media. More regular coverage of Corbyn led to a sense amongst the public that his previous portrayal in the media was unfair and his approval ratings improved as a consequence. Theresa May was fortunate in the fact that she received unwavering support from the majority of print media outlets, but she struggled to thrive online. Her dominance in the mainstream media was neutered by highly opinionated, pro-Labour online publications that reached similar sized audiences as most national news brands; according to analysis by Buzzfeed, 23 of the top 25 most shared articles had a pro-Labour stance or were about traditionally strong left-wing issues and there was not a single pro-Conservative article in top 25. And this trend continued after polling day when, despite winning just 30 net seats and still being short of the Conservative Party’s vote share, Corbyn advocates managed to spin a defeat as a historic win through earned channels. Lesson #5: Share of voice is still an important metric and you can’t afford to let your opponents outspend you in paid media. But it’s possible to gain competitive advantage by engaging with emerging online content giants that may be more sympathetic to your cause than some of the traditional mainstream media. Many traditional politicians have been badly bruised and beaten during recent times. They have been trounced in the polls by a new breed of leaders often rated as rank outsiders by the pundits. These winners have sensed the breakdown in tribal loyalties and the opportunity this has created for non-demographic appeals. These challengers had new narratives, tight, nimble teams, clear enemies, empowered activists, and innovative new media management. Brands face re-election every day – could yours benefit from some of this outsider thinking?